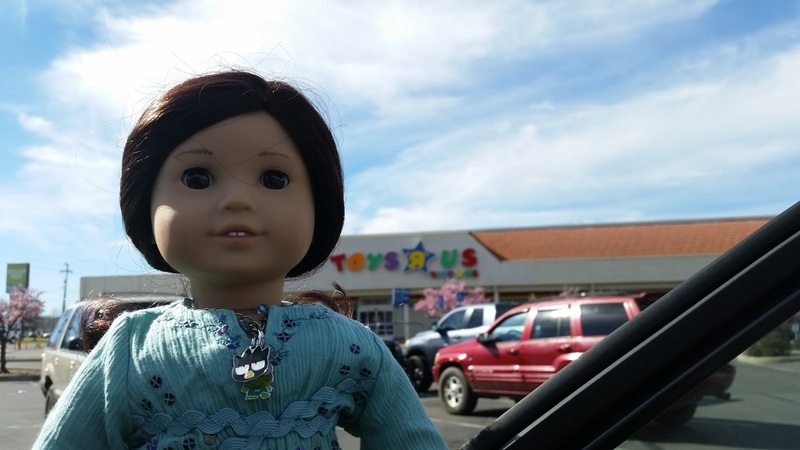 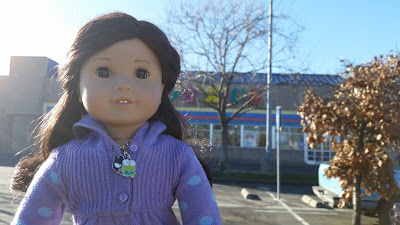 Jess at a Toys R Us on the way to Roseville. 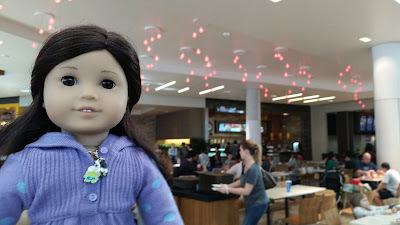 Jess at the food court. 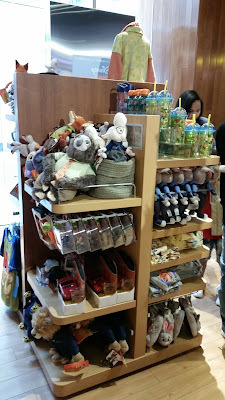 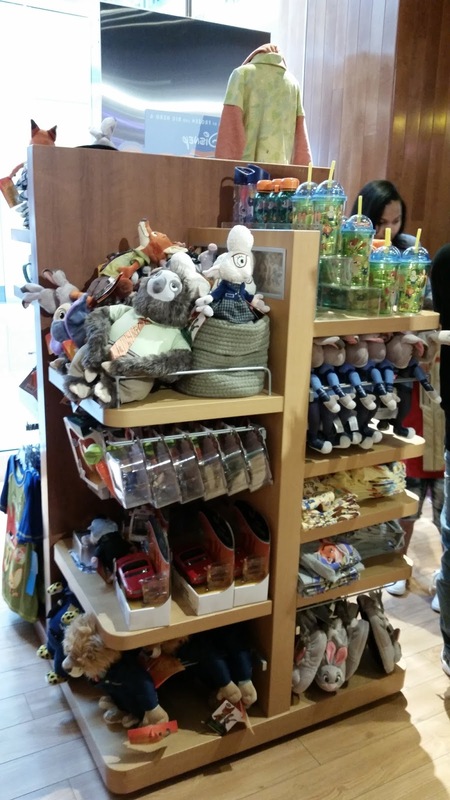 The Disney Animator's Collection display. 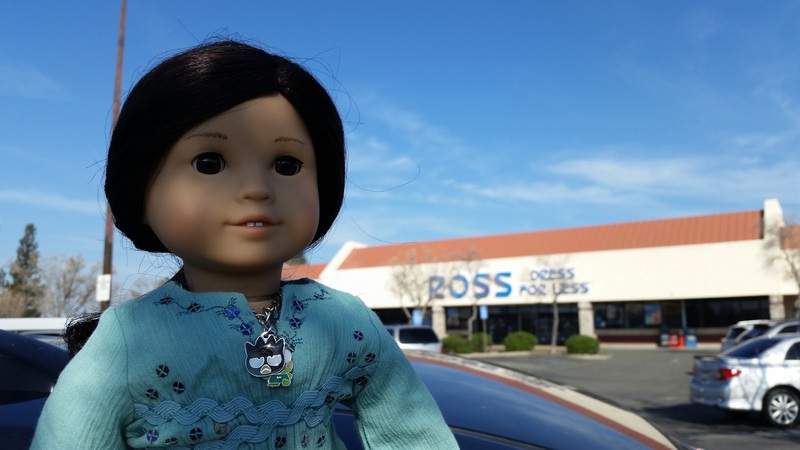 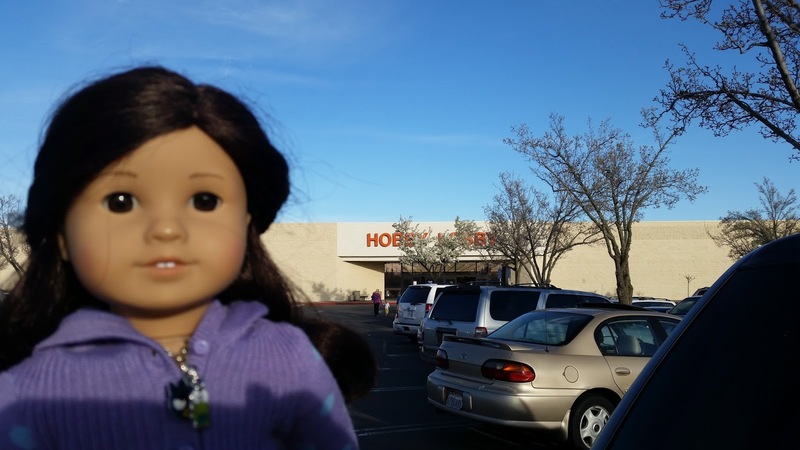 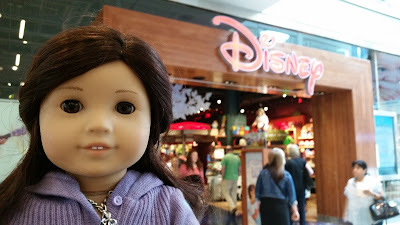 It was really fun to get to see some of the new, big singing dolls in person. 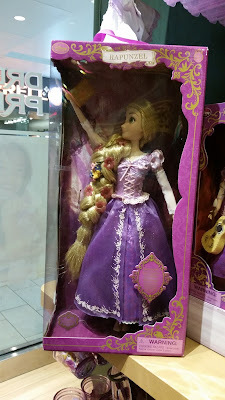 Here is Rapunzel. 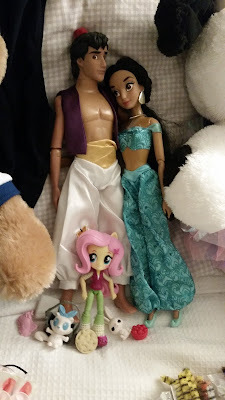 I've told myself that I don't need any more big Disney dolls. This one was sure tempting, though. Especially at 25% off. I love her face. 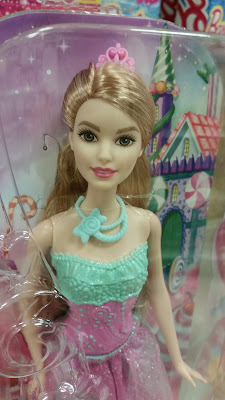 :) She still had the weird, blue arms of the first version of this doll, though. 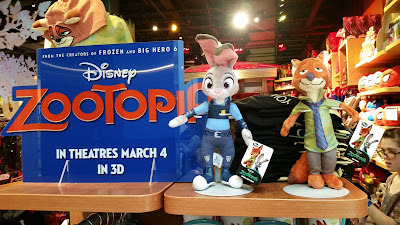 Of course, with Zootopia's theatrical release on the horizon, there was a fun Zootopia display up. 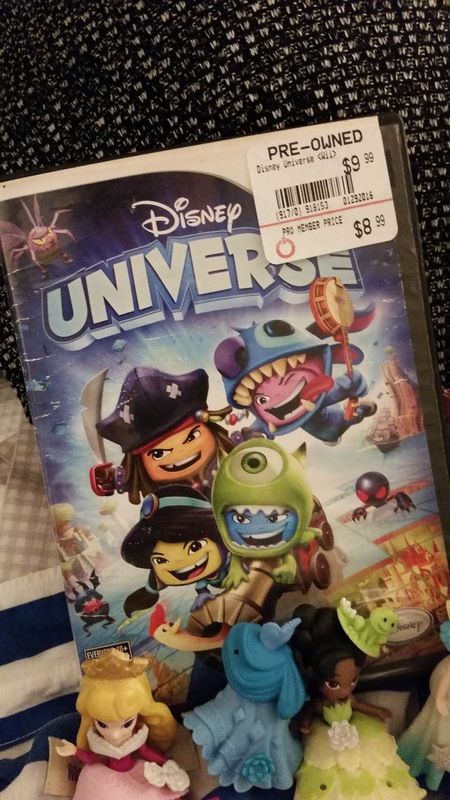 I really wish I knew which characters will be my favorites. 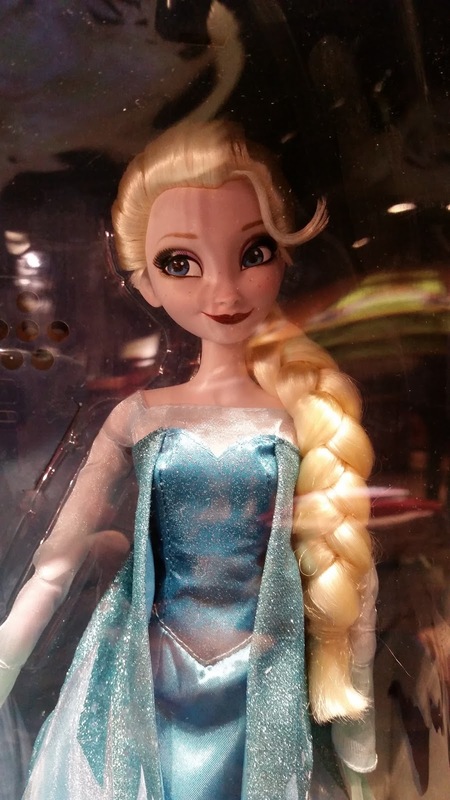 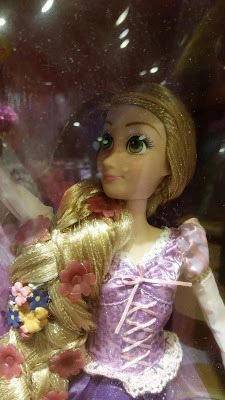 I can't help thinking of the Big Hero Six Honey Lemon and Go Go dolls that sold out before I could snag them. 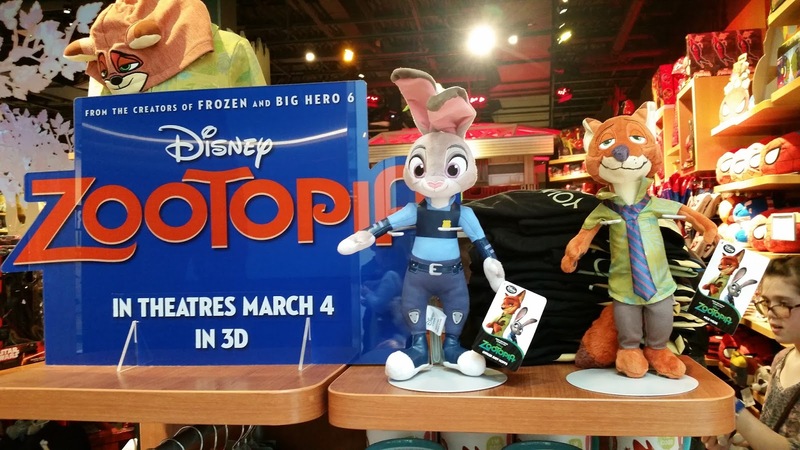 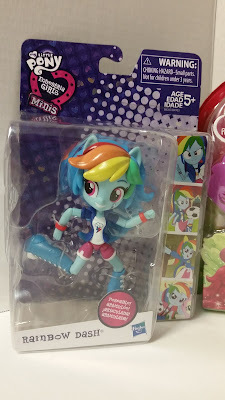 I hope it won't be the same with Zootopia merchandise. 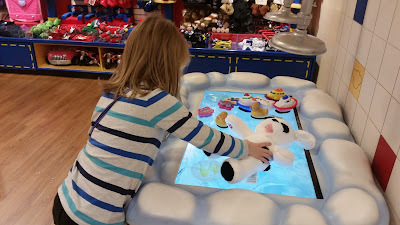 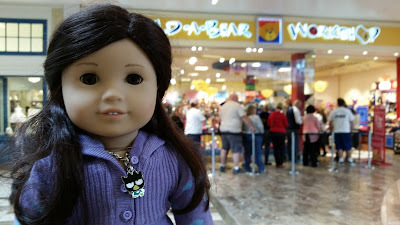 Build-A-Bear was one of our next stops. Little Gal decided to make a stuffed puppy to add to her puppy family. 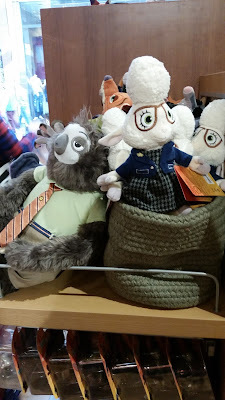 Oldest Gal made a boy bear to go with her girl bear (sorry, I didn't get any pics of her that didn't show her face). 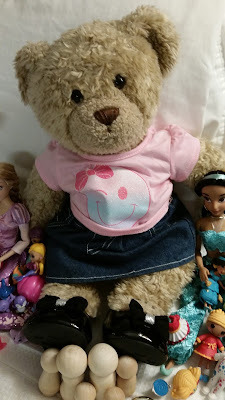 Middle Gal opted for a nice new outfit for her bear instead. 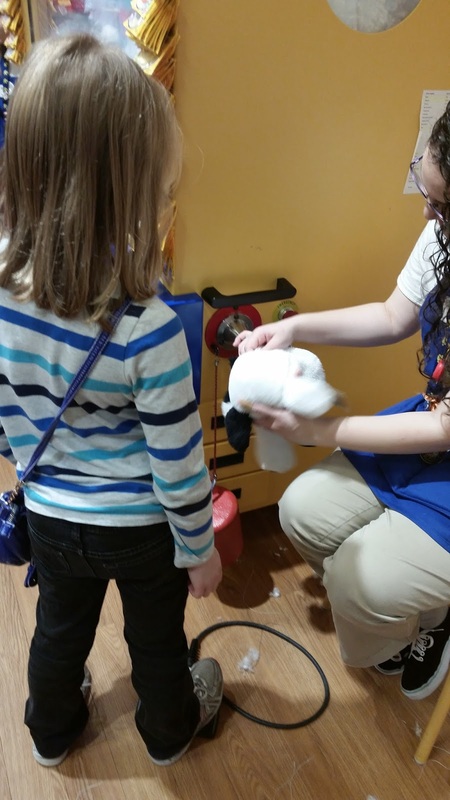 Giving her new puppy a "bath." 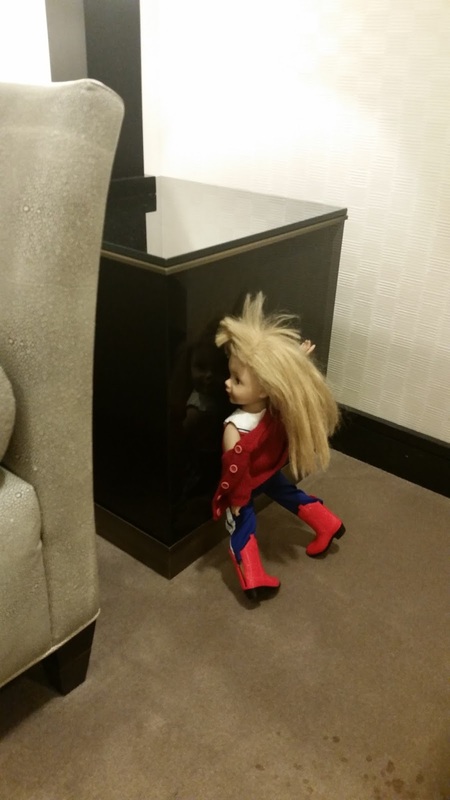 After all that jumping, it was time for another bathroom break. 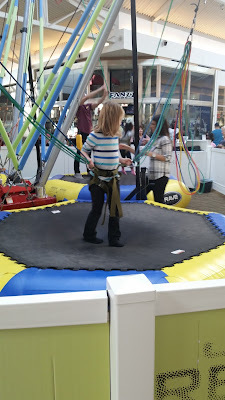 And this is pretty much where my pictures of each event went out the window. (In my defense, documenting a trip while following three overly excited girls with lots of spending money is not the easiest task in the world.) 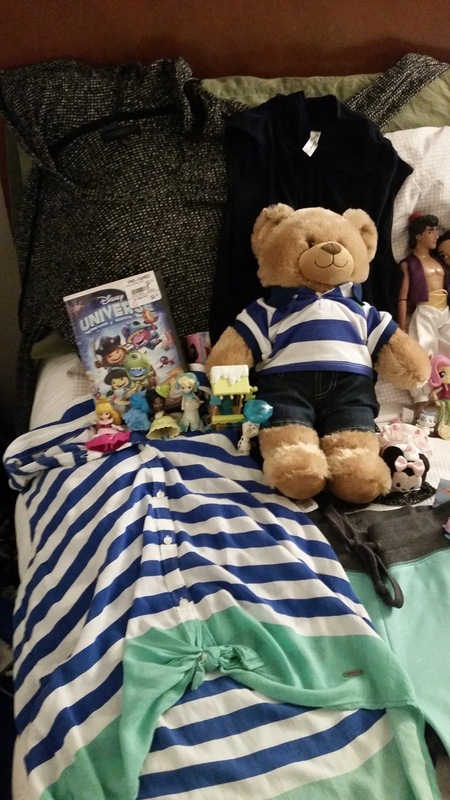 ;) So the rest of the pictures in this post will not be quite so organized. 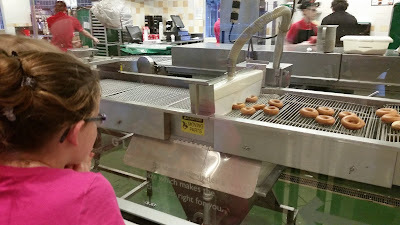 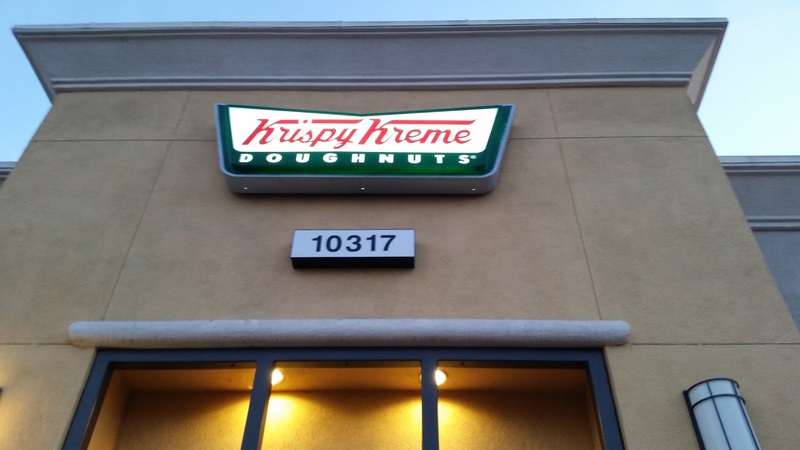 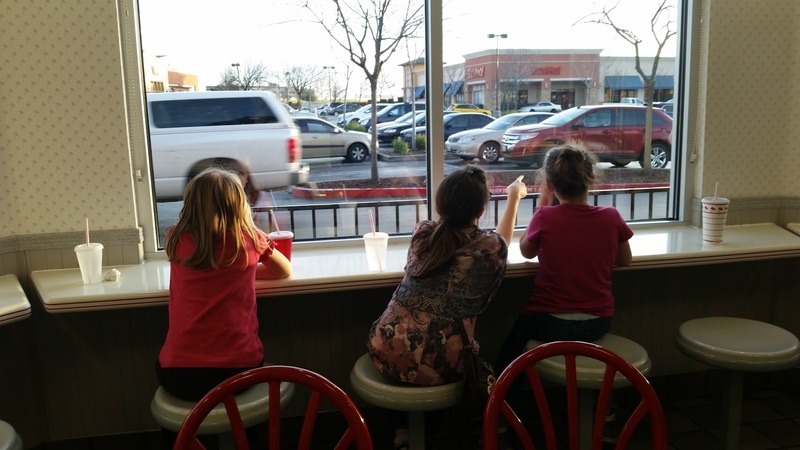 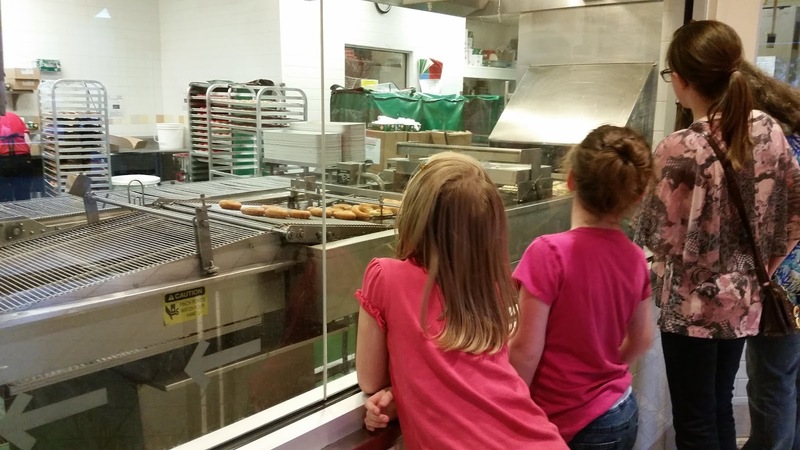 The "hot light," signaling fresh donuts, was on when we arrived, so we got to watch the donuts as they were made. 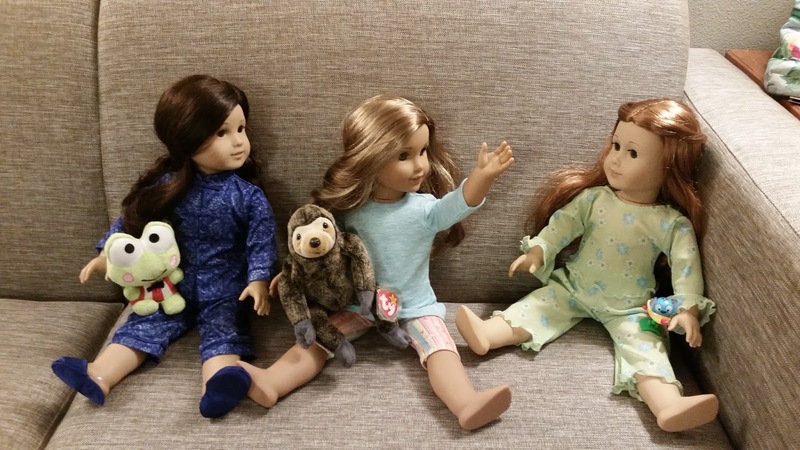 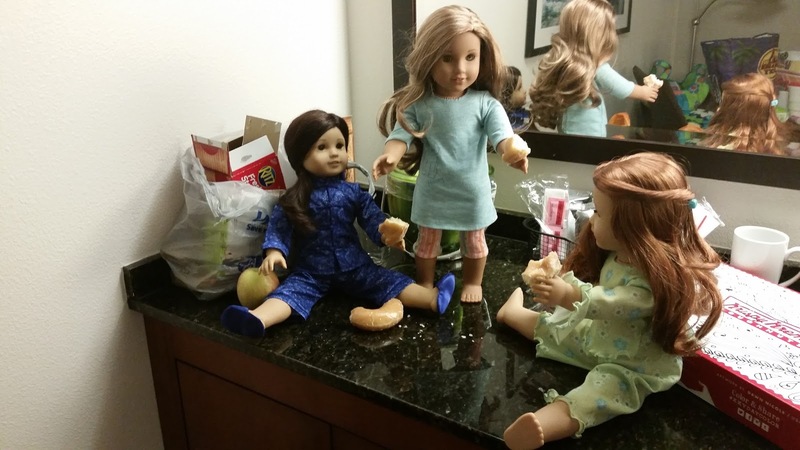 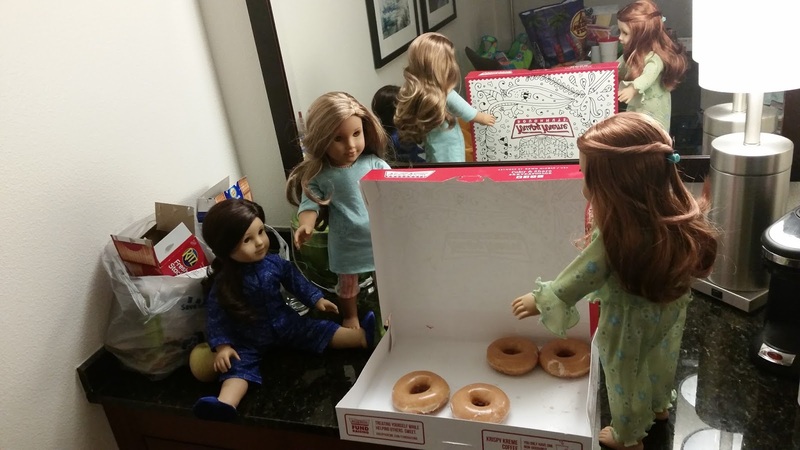 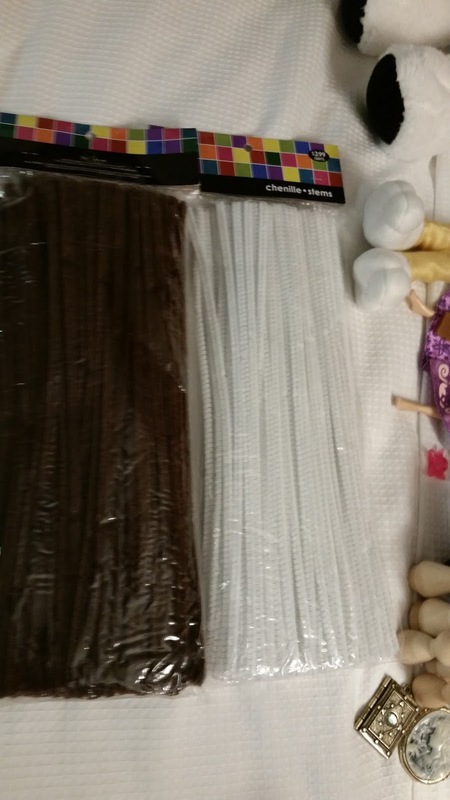 From left to right are Jess, Lea (my mom's doll), and London (Truly Me #61-Mimi's doll). Here the three musketeers visit in their comfy jammies before heading to bed. To be honest, I've pretty much reached the conclusion that doing a full doll photo story on these joint birthday trips is just cramming a little too much into one event. 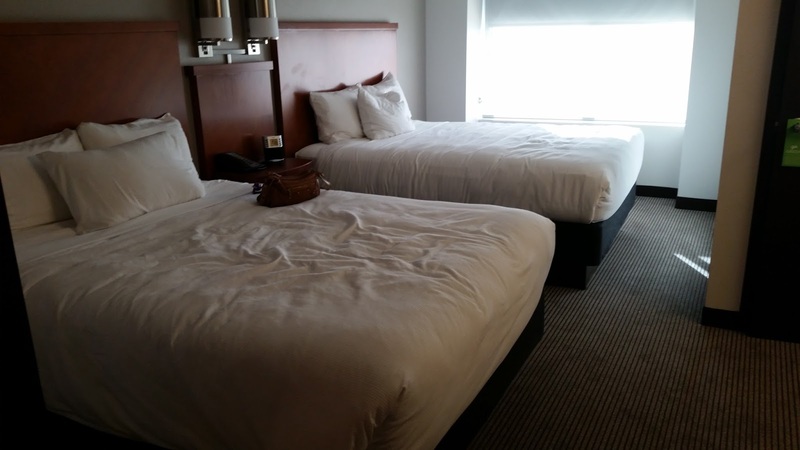 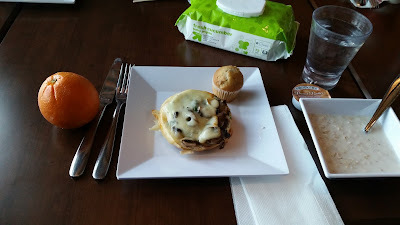 I always want the birthday trip to be about the girls, not my blog. ;) I might even take a Zelf along instead of a doll next time. 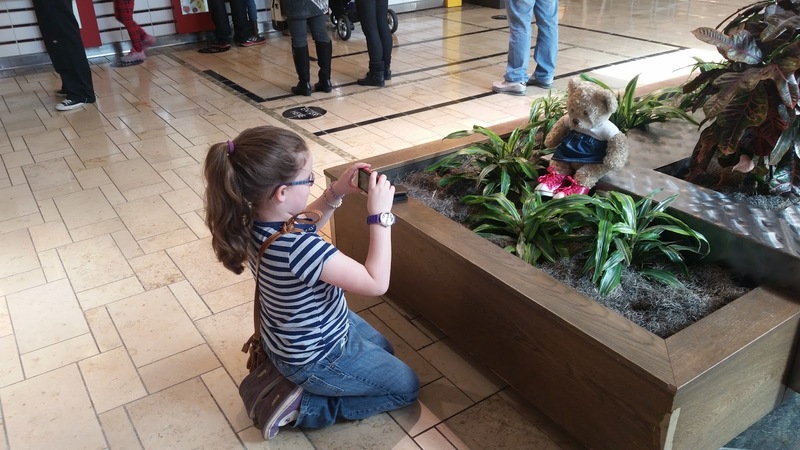 It makes the photo ops a little easier and quicker. 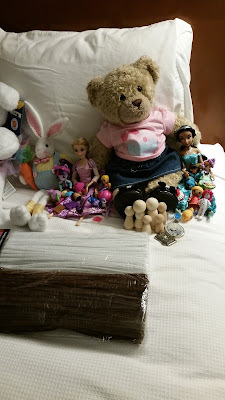 On our last night in the hotel, we took our typical "loot" photo. The stuff on the left is Oldest Gal's. The middle section belongs to Little Gal, and the pile on the right is Middle Gal's. 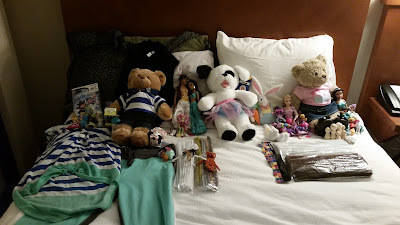 They each made a few more purchases on our last day, but this gives you an idea of the majority of what they bought. She also bought a Disney Universe game for our Wii from Game Stop. 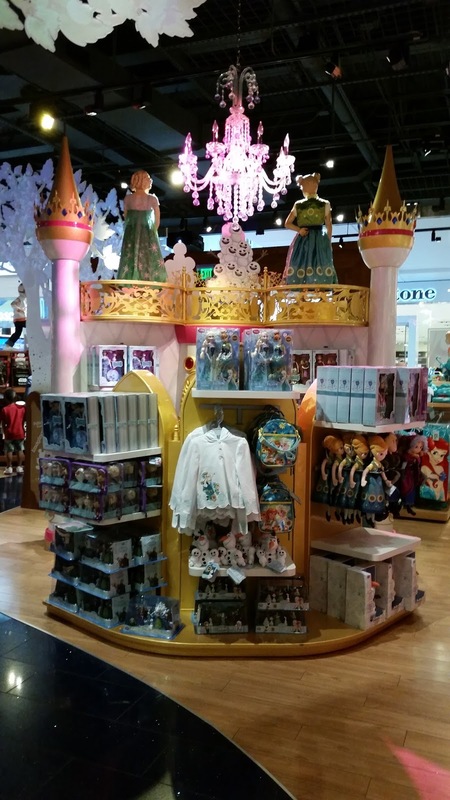 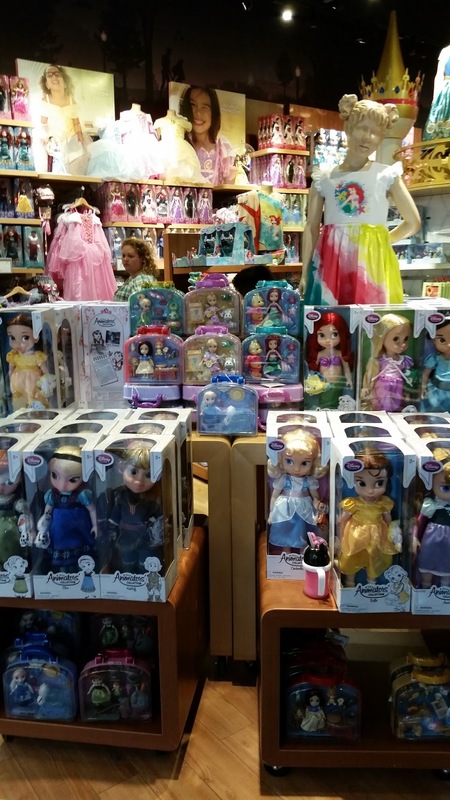 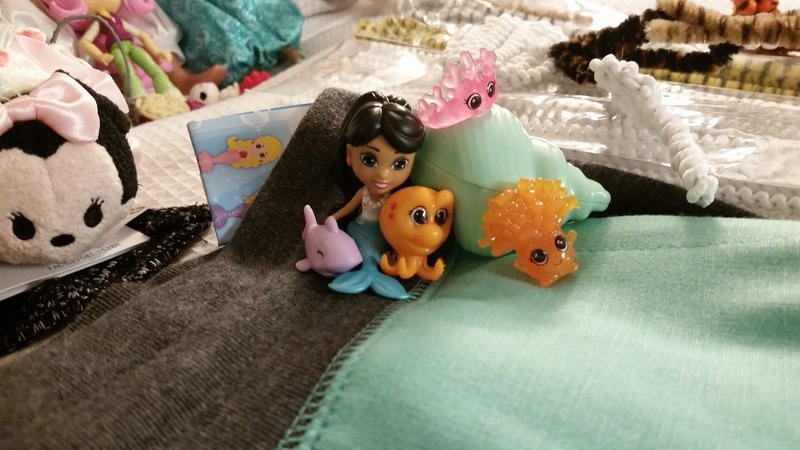 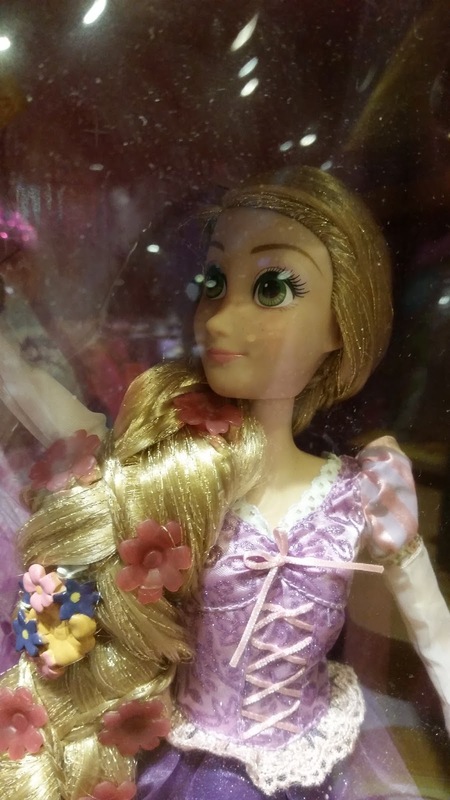 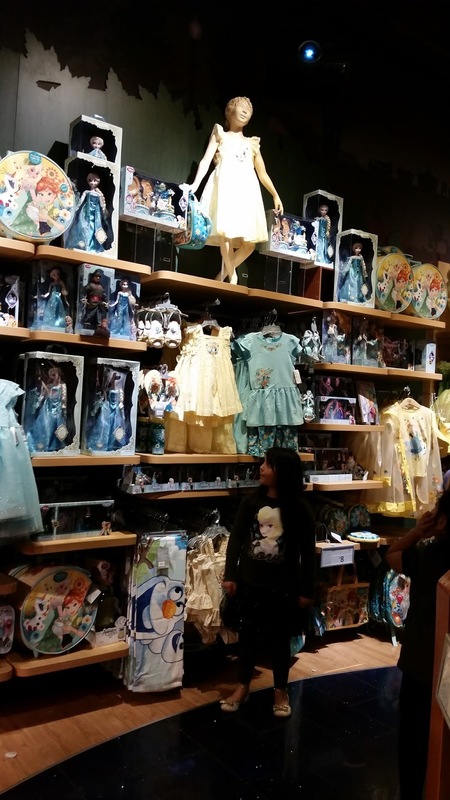 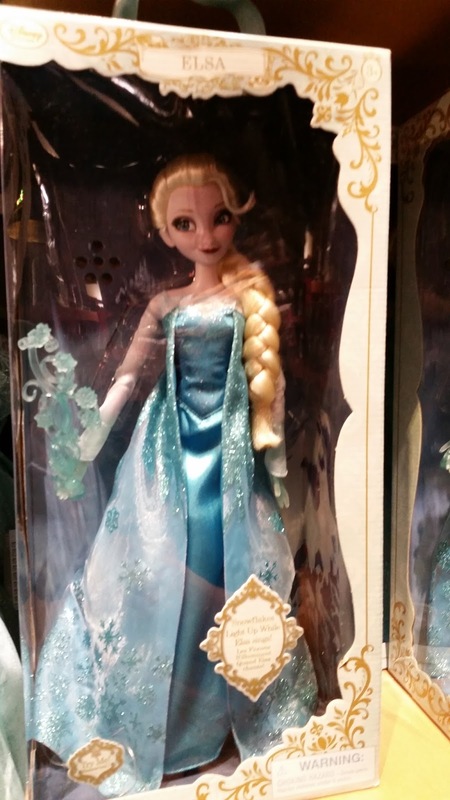 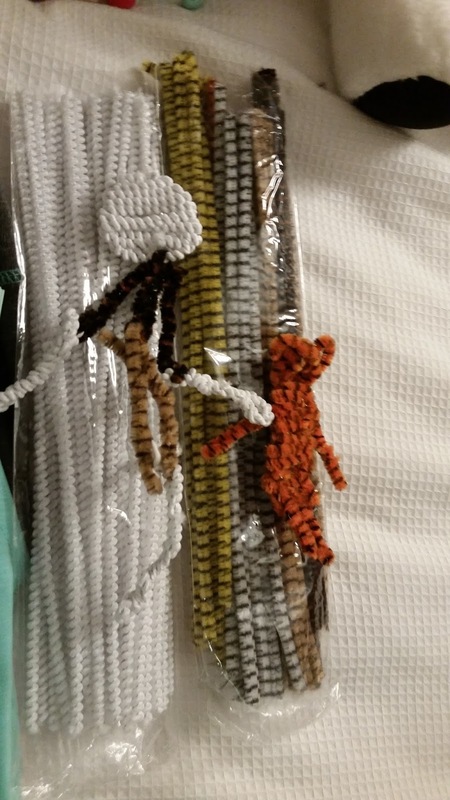 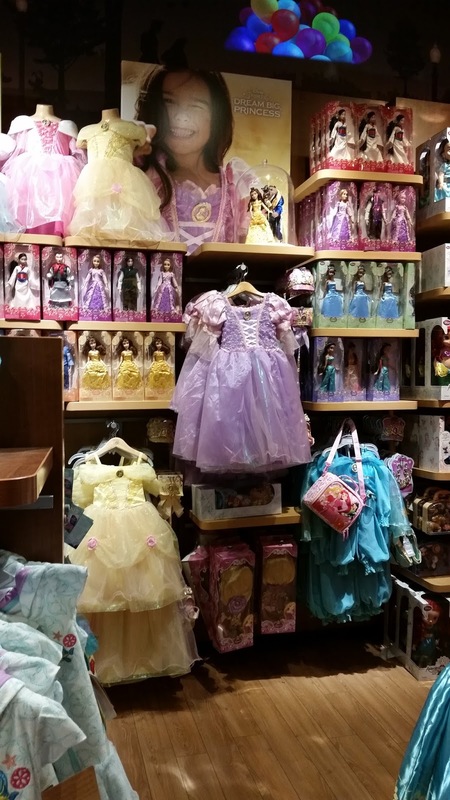 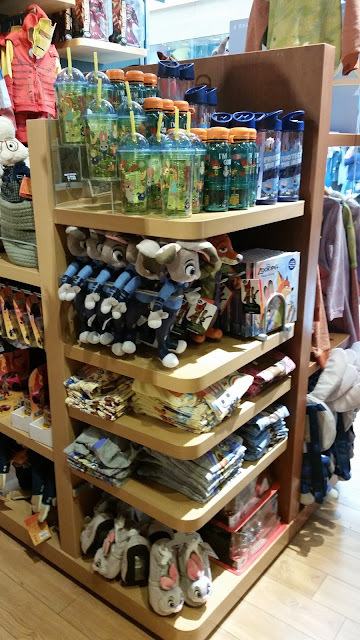 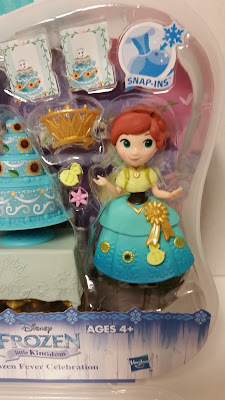 At the bottom of the picture, you can see her Disney Little Kingdom Aurora and Tiana dolls. 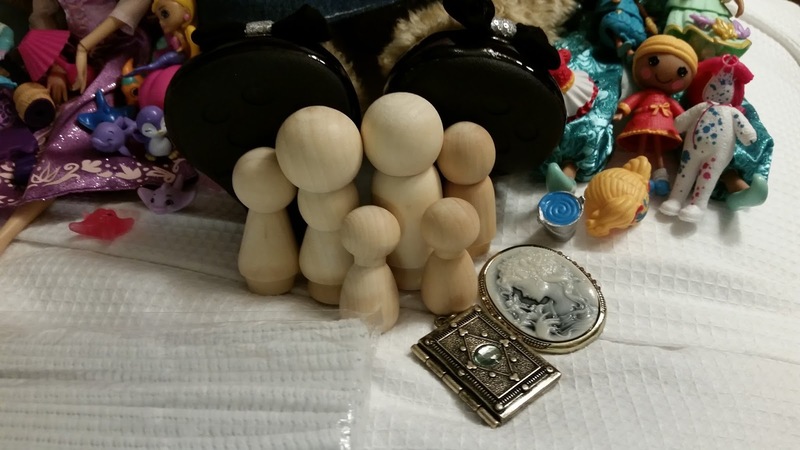 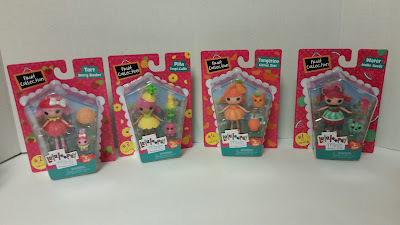 Here's a better look at the Little Kingdom dolls. 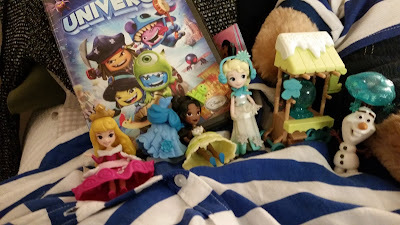 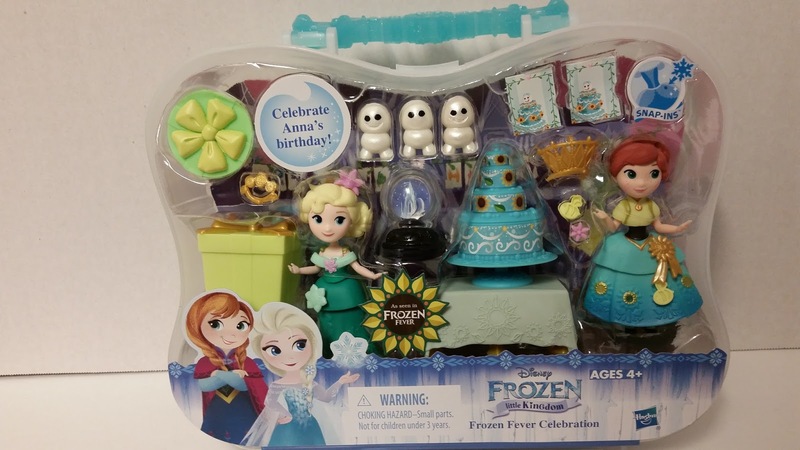 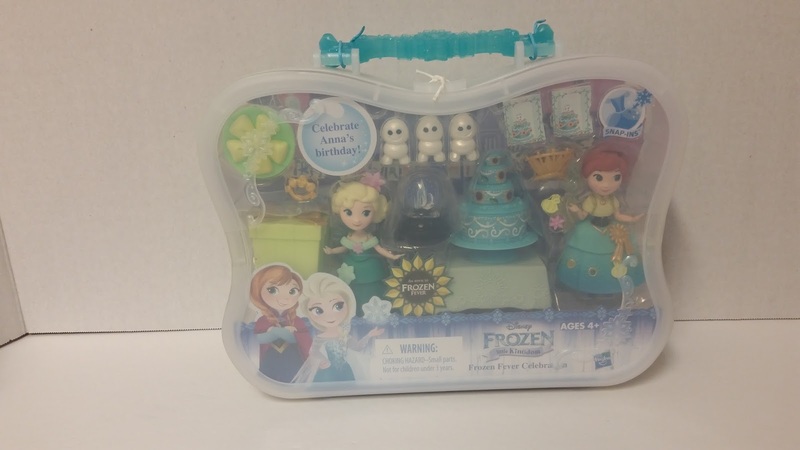 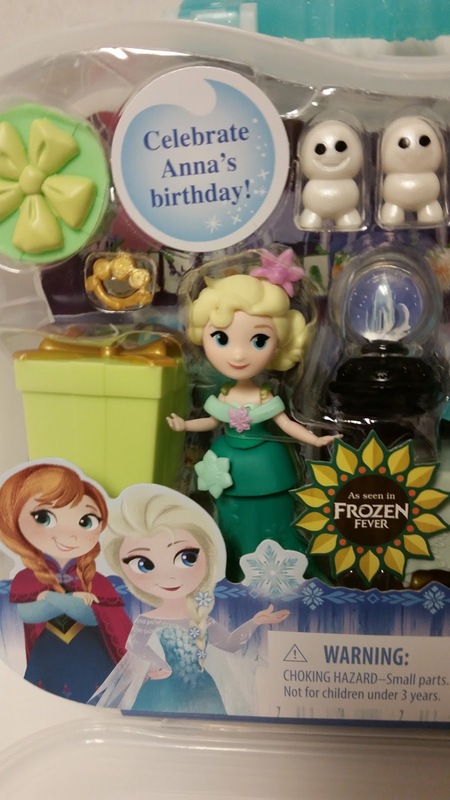 She also purchased the Frozen Little Kingdom ice skating set, but she split it with Middle Gal, so Anna and her accessories are in Middle Gal's pile. 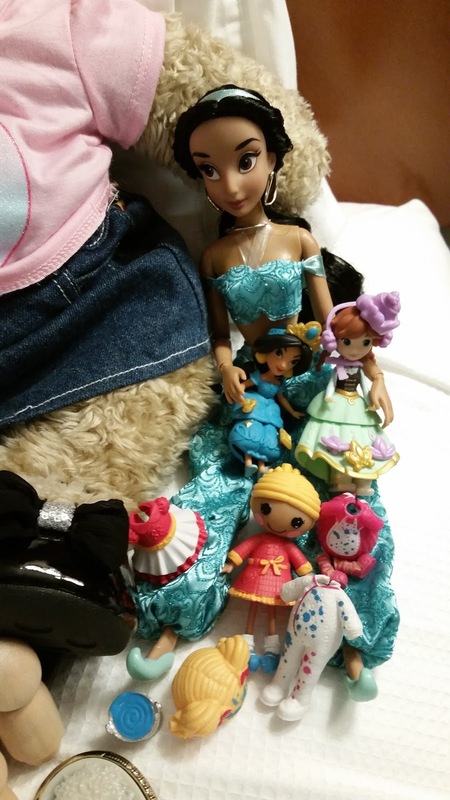 And may I just say that Tiana and Aurora are both absolutely darling? 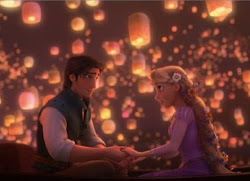 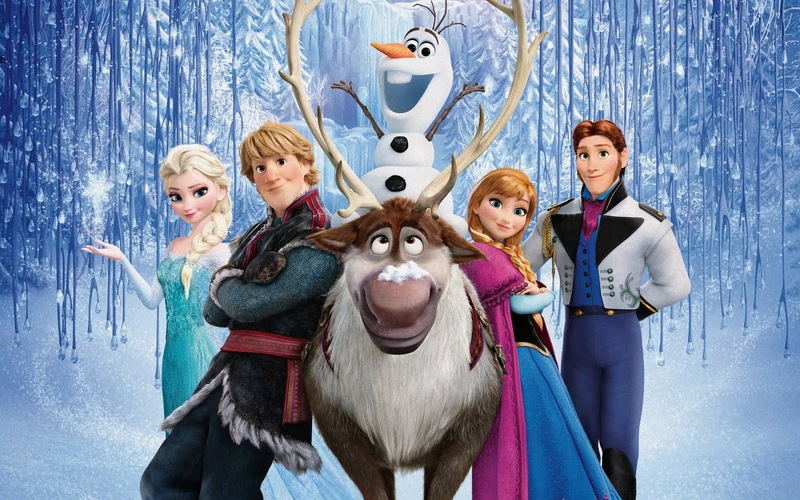 :D Elsa is too, but those two are just adorable! 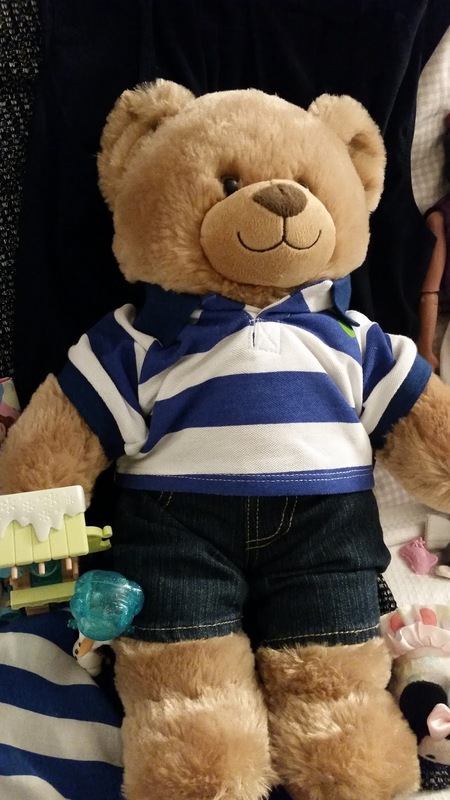 This was the bear and outfit Oldest Gal chose at Build-A-Bear. 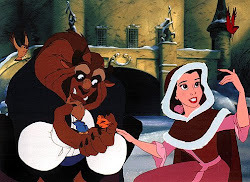 She named him "Buttons." 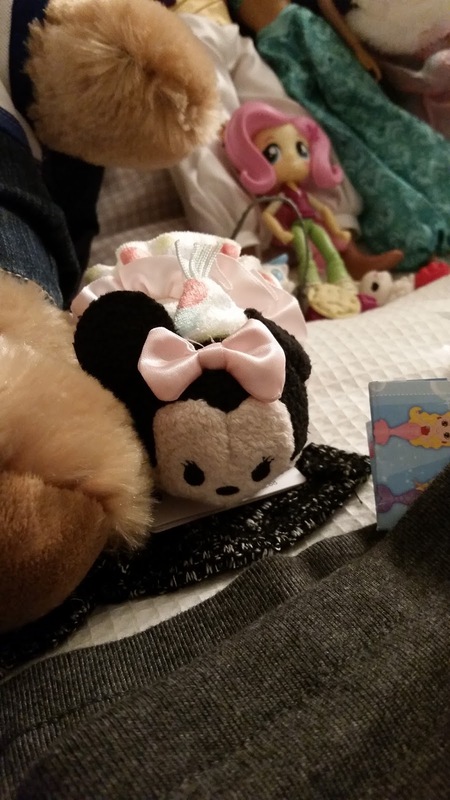 Here's her birthday Minnie Tsum Tsum from the Disney Store. Little Gal decided on the name "Faith" for her puppy. At the Disney Store, she purchased Aladdin and Jasmine. 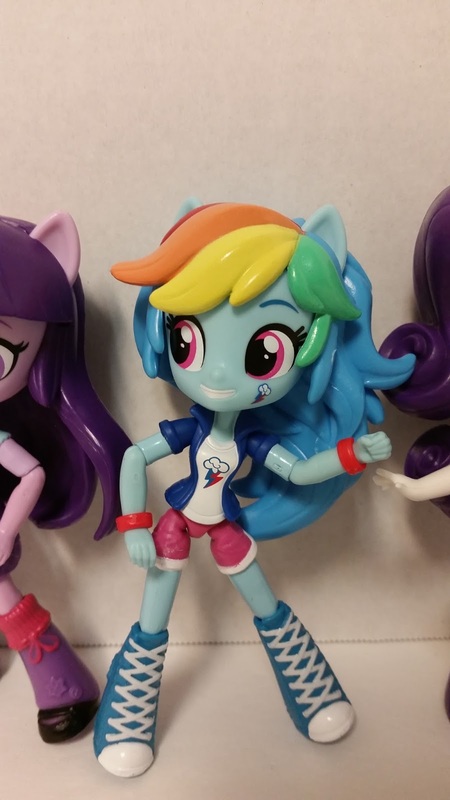 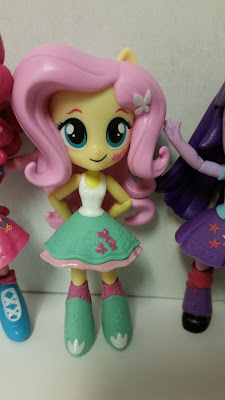 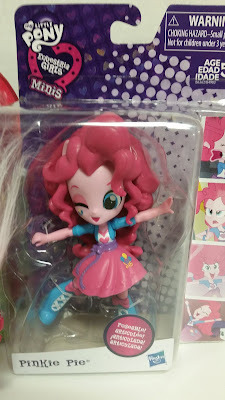 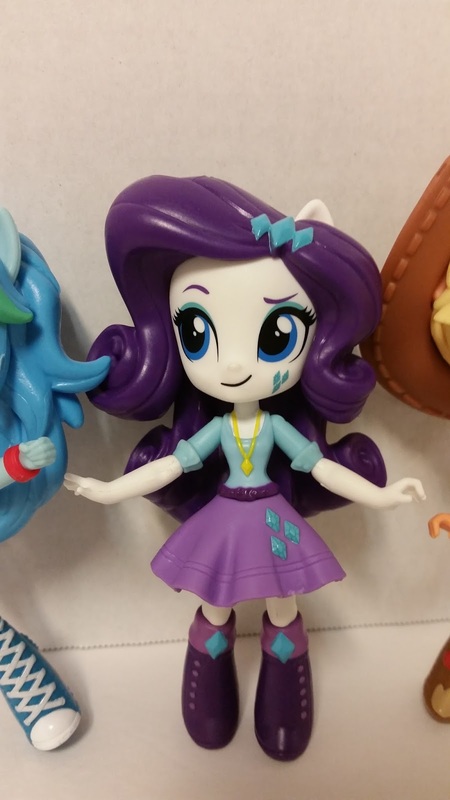 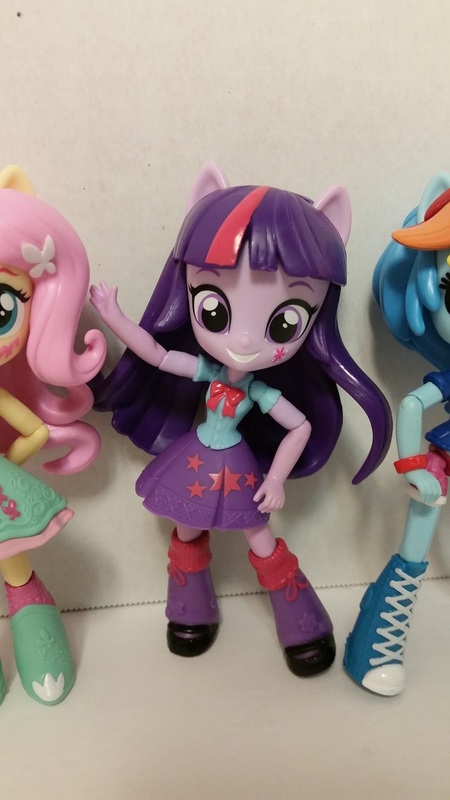 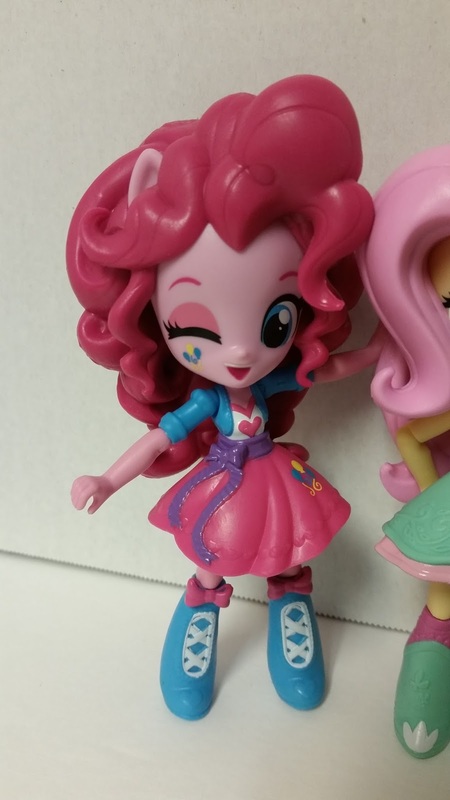 And she got the slumber party Equestria Girls Mini Fluttershy set at Toys R Us. 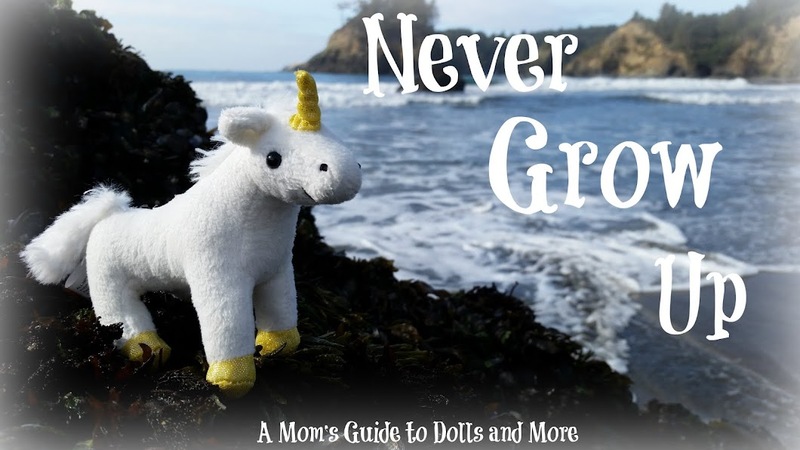 Middle Gal has purchased a plush rabbit from Hobby Lobby every birthday trip for the past few years, so the bunny on the left is in keeping with tradition. 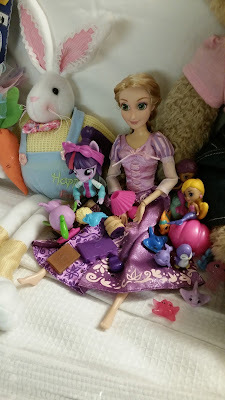 Rapunzel was her Disney Store purchase, and Twilight Sparkle and the two Splashlings sets were from Toys R Us. 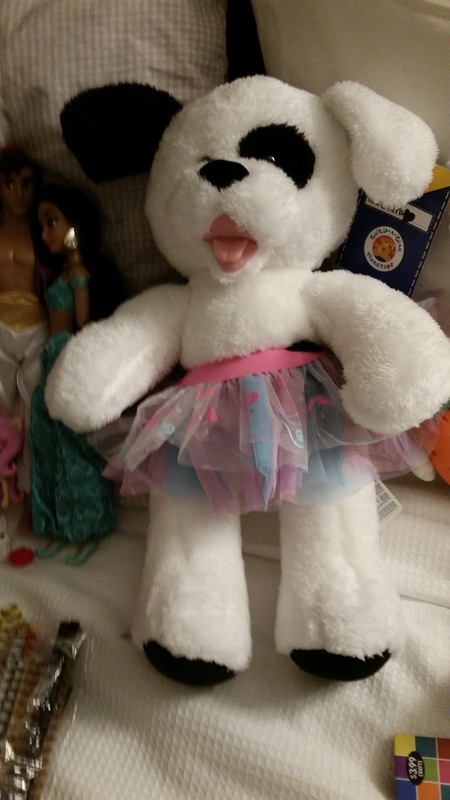 This is the Build-A-Bear we built for Middle Gal when she was only six months old. :) Even though the bear isn't new, her outfit and shoes are, so Middle Gal decided to set her up in the picture. My mom has started collecting the mini DAC dolls. 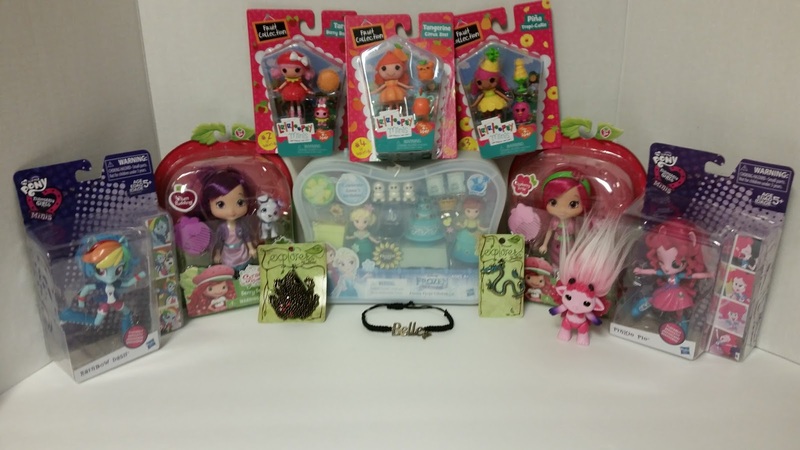 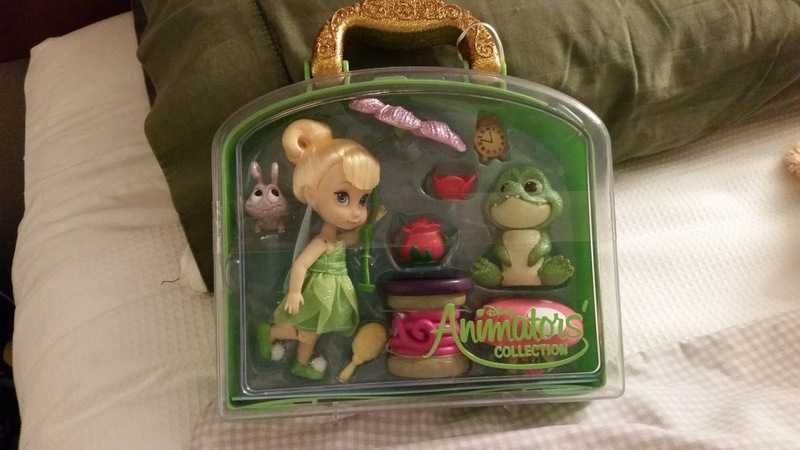 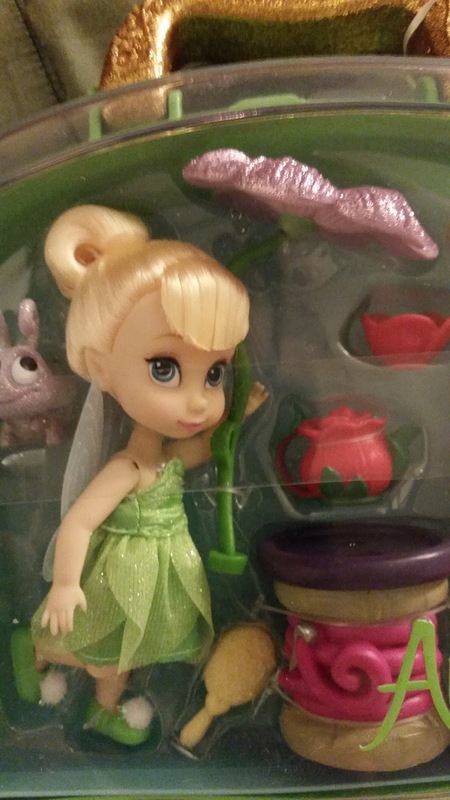 When she saw this adorable Tinker Bell set, she decided to add it to her collection. Her pet Tick Tock Croc is pretty cute, too. ...Hobby Lobby again, and Toys R Us and Target. 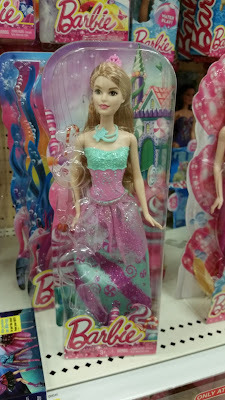 In Toys R Us, I actually found a Zelf I don't have yet (wonder of wonders). 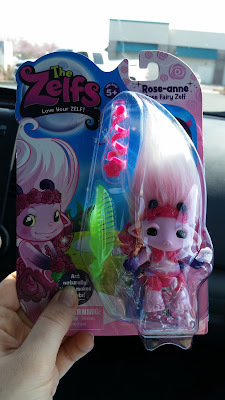 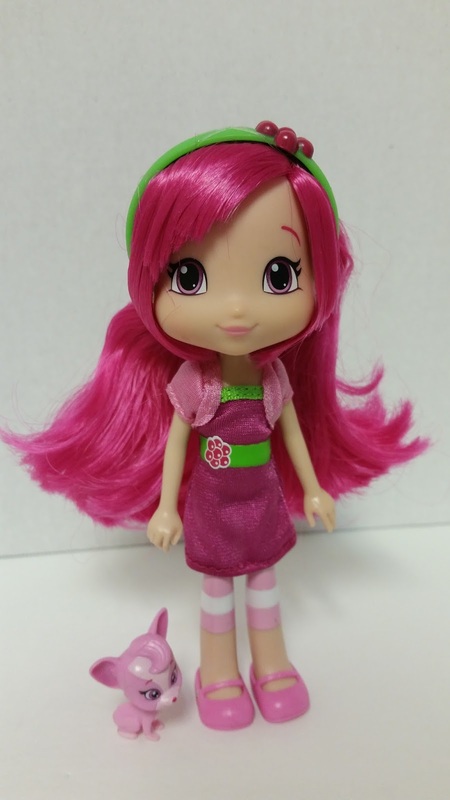 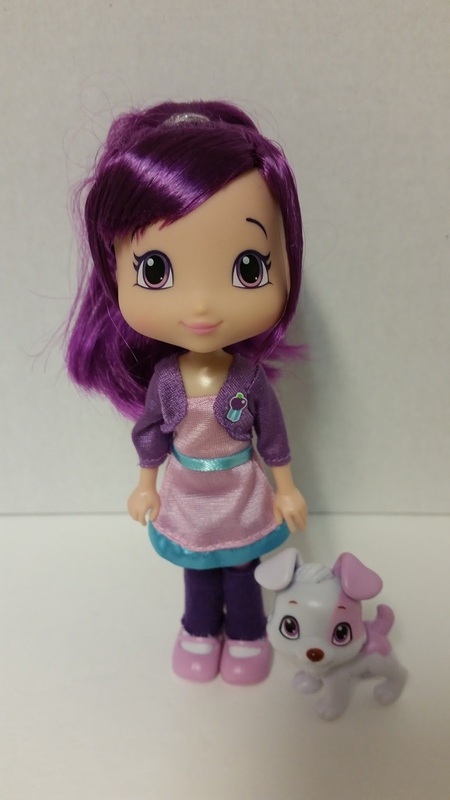 ;) So Rose-anne is now a part of my Zelf collection. 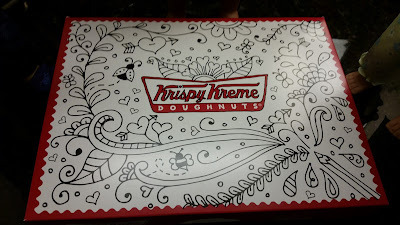 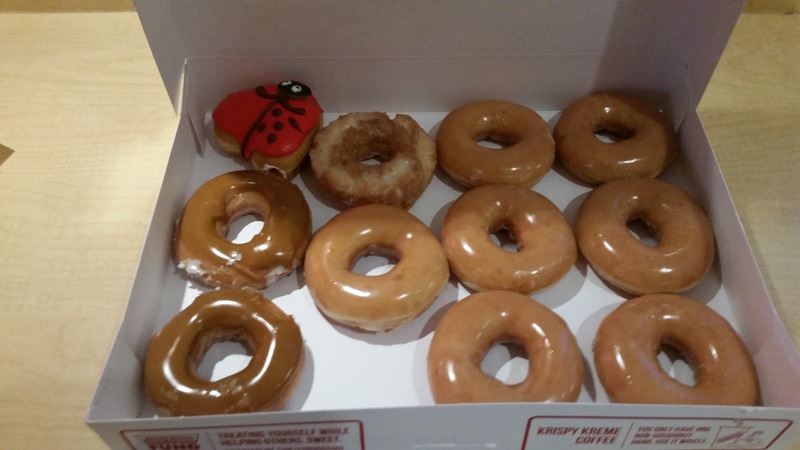 For anyone who's interested, here's a picture of the full box. 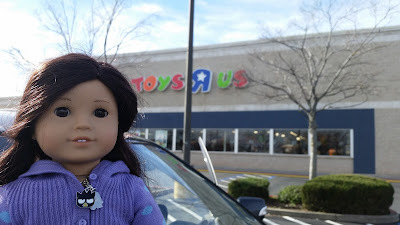 Once we finished up at Target, it was time to head back home. We had a wonderful time together, but it was nice to get back home. 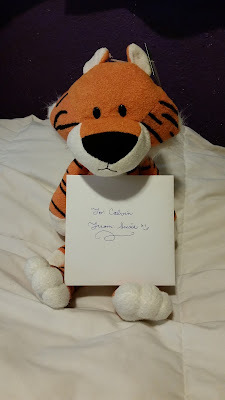 At the Target in Roseville, I found this stuffed tiger that reminded me a lot of Hobbes from "Calvin and Hobbes." 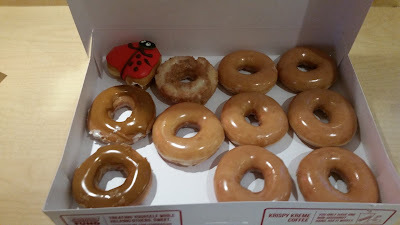 Hubby and I used to read the comic strip all the time when we were young, so I thought it would be a fun souvenir for him. I also wrote him a card and signed it "To Calvin from Suzie." 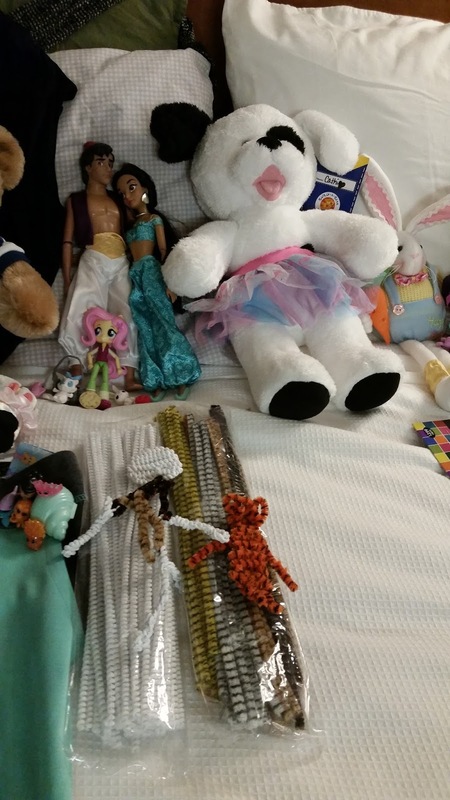 ;) It was waiting on his side of the bed for him when he got home. Here's what I ended up coming home with this time around. 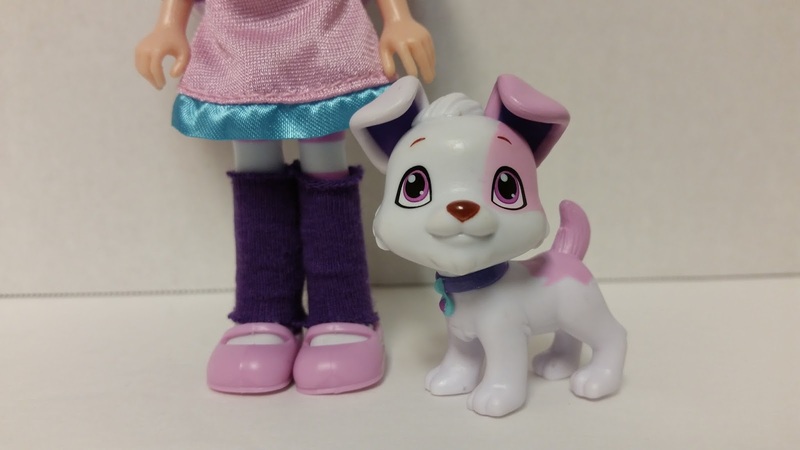 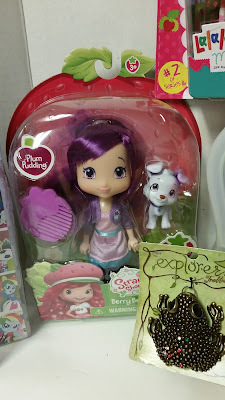 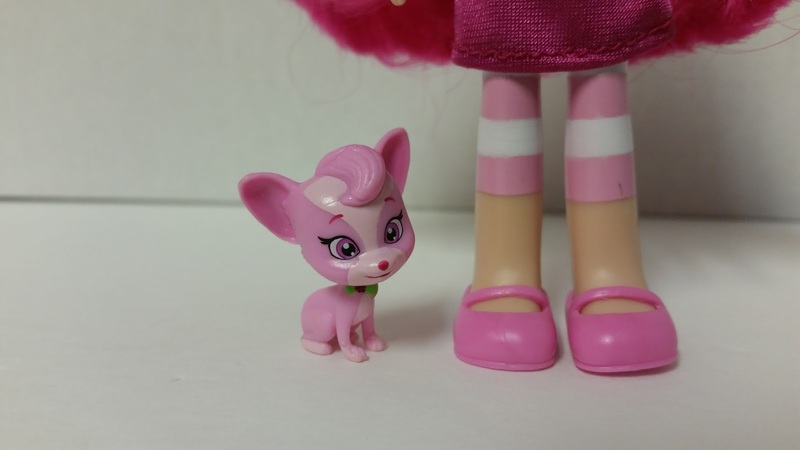 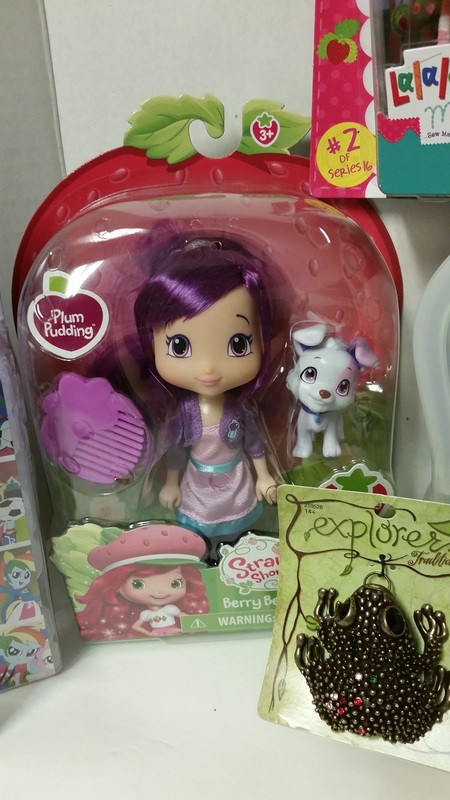 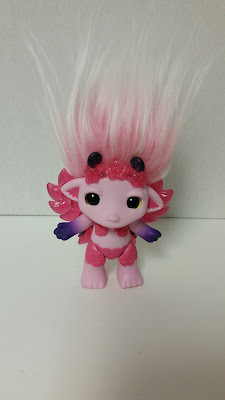 Plum Pudding was the only Bridge Direct SSC character I didn't have yet, so it was fun to add her to my collection. 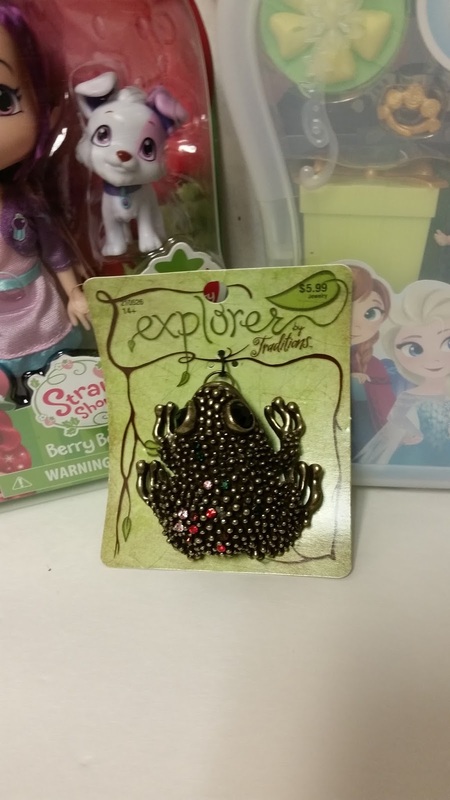 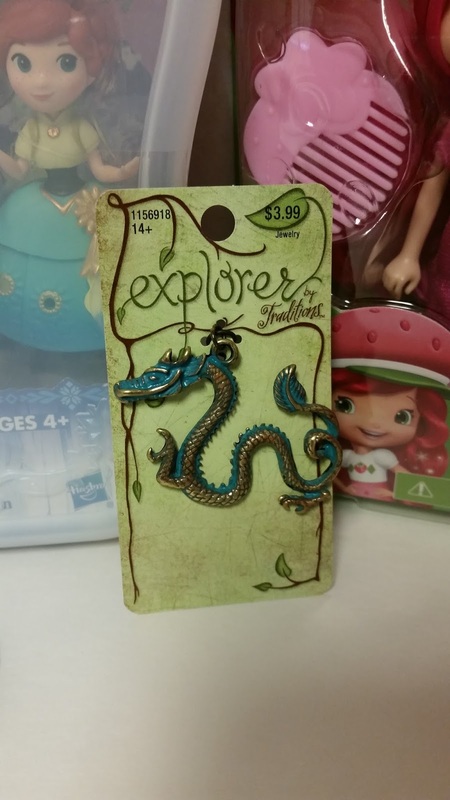 I also ended up with a couple of fairy tale-themed charms from Hobby Lobby. 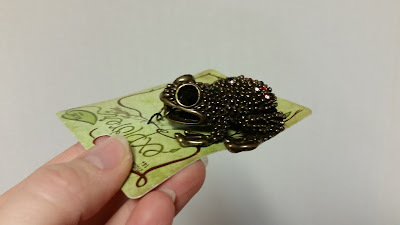 This frog one was really cool. 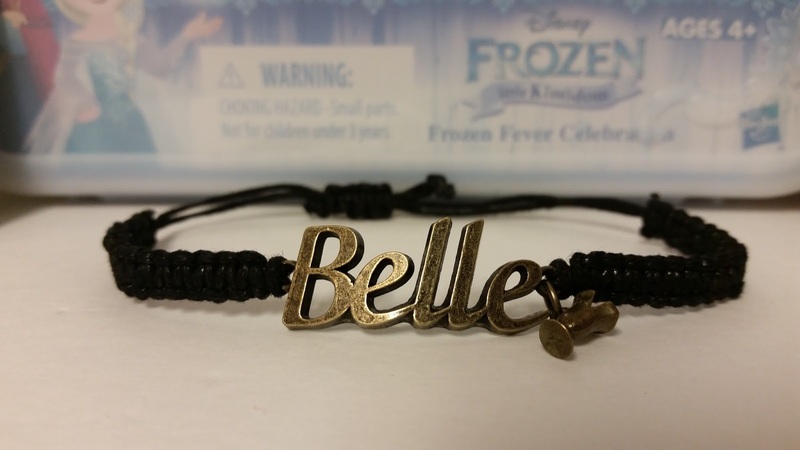 At Hot Topic, I found this adorable Belle bracelet to go with my other Beauty and the Beast-themed jewelry. 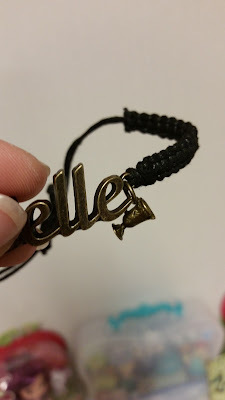 I love the little Chip charm hanging from one side. 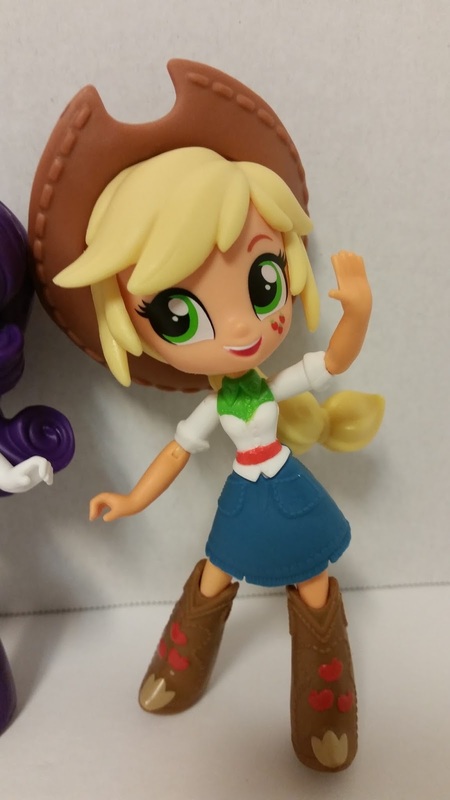 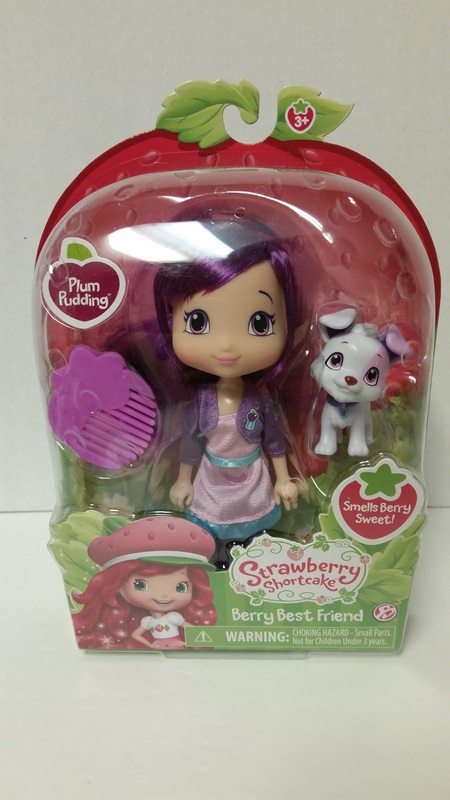 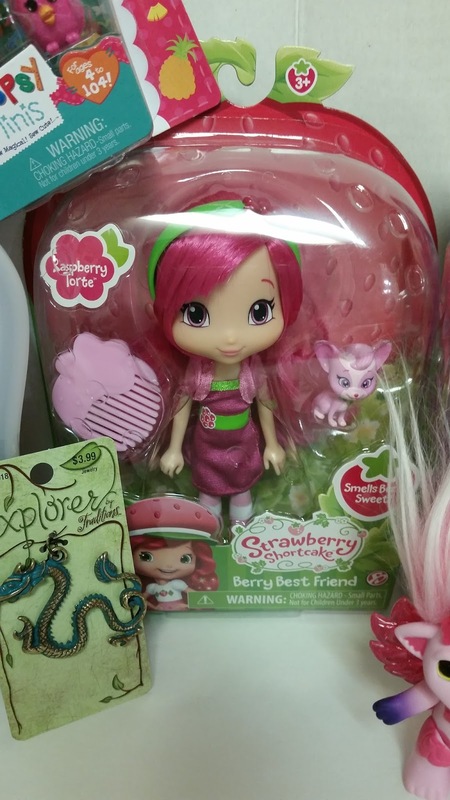 I did already have a Raspberry Torte from The Bridge Direct, but I really liked that this one was in her meet outfit, so I went ahead and snagged her as well. 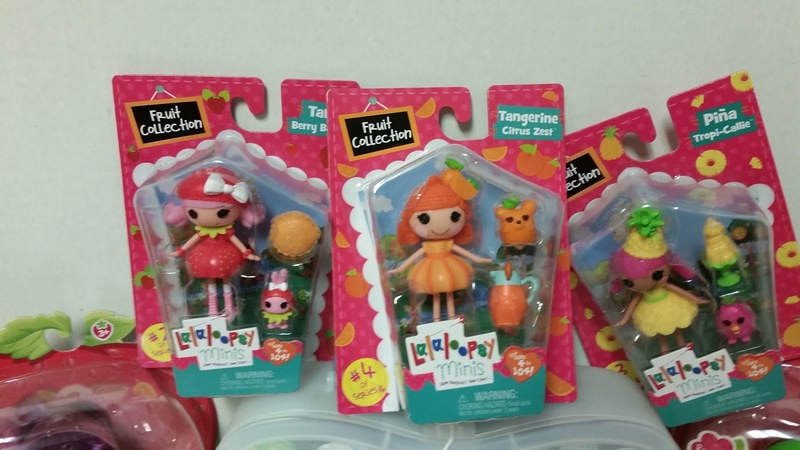 I also was able to find the remaining three "Fruit Collection" Lalaloopsies I needed at Toys R Us. 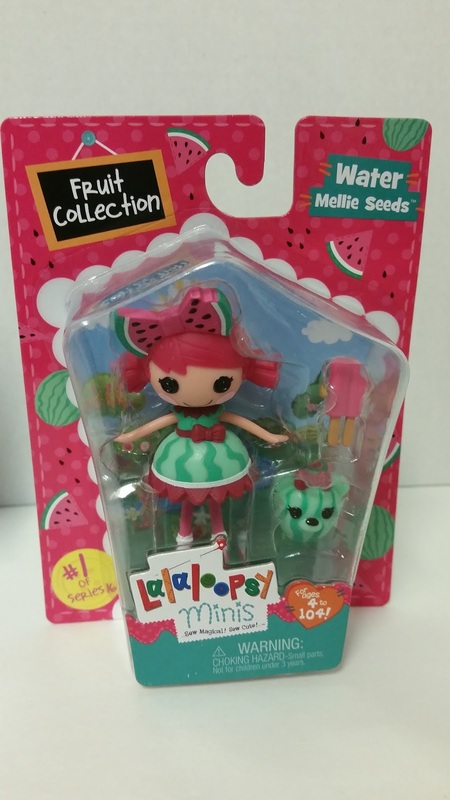 Mom had already found me Water Mellie Seeds (my favorite of the series) on a previous Toys R Us run, so now I have all four. I haven't decided if I'm going to open these ones yet. 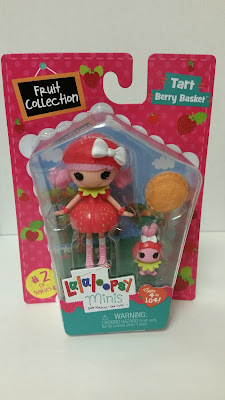 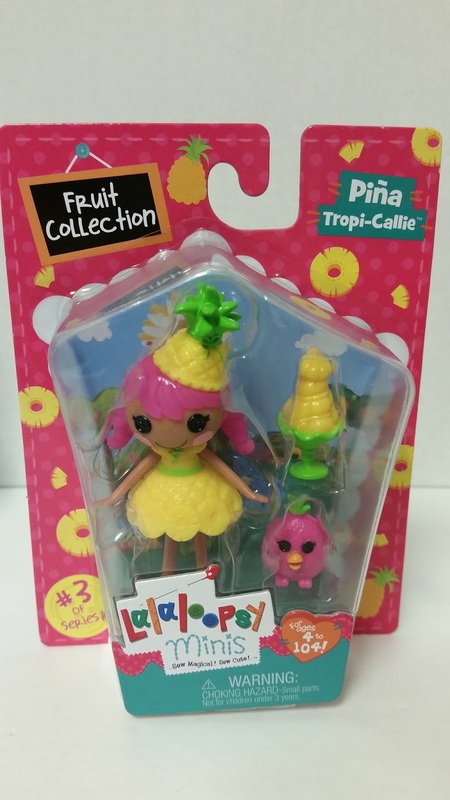 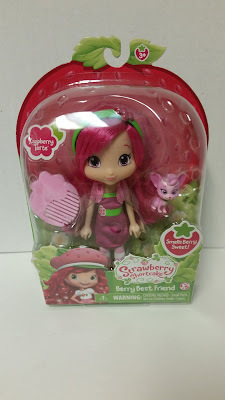 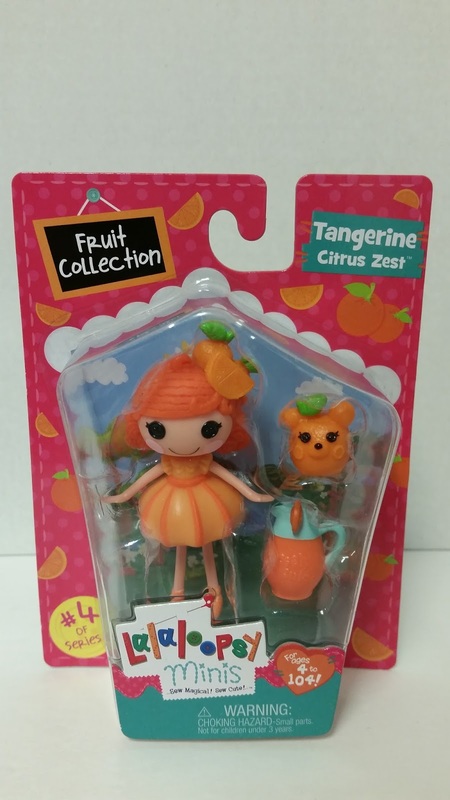 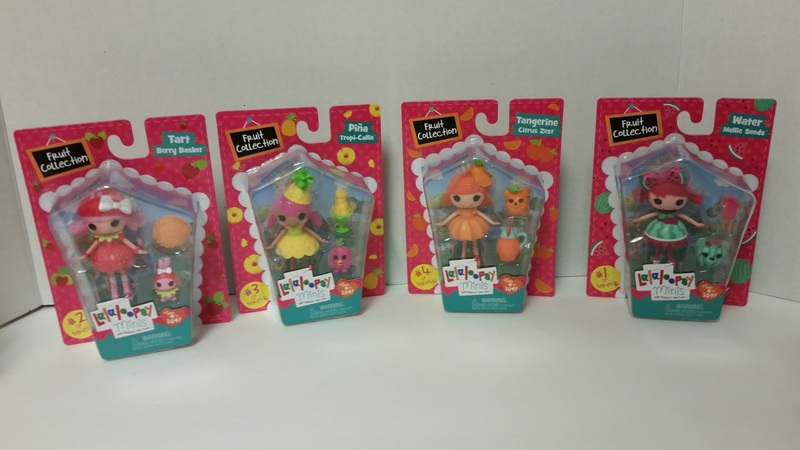 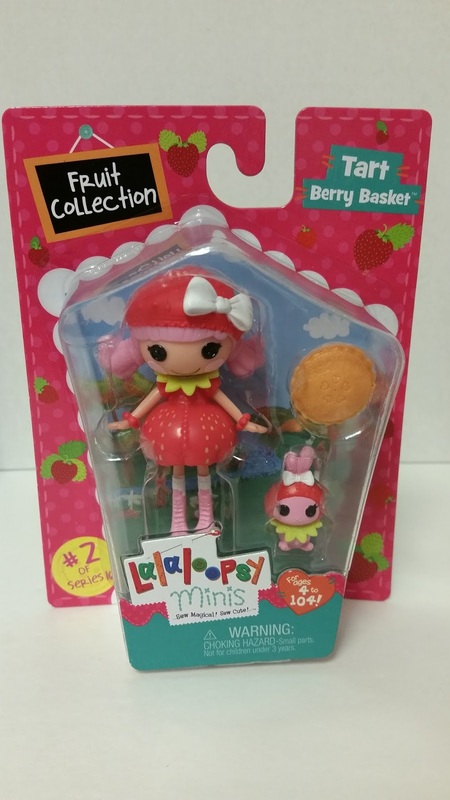 They look super cute in their fruit-themed packaging and would be fun to hang on my wall as-is...especially now that the mini Target exclusives seem to have been discontinued. 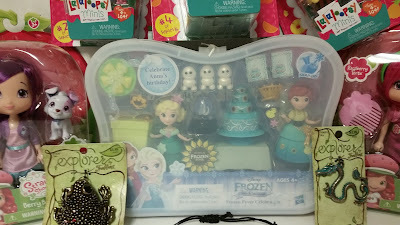 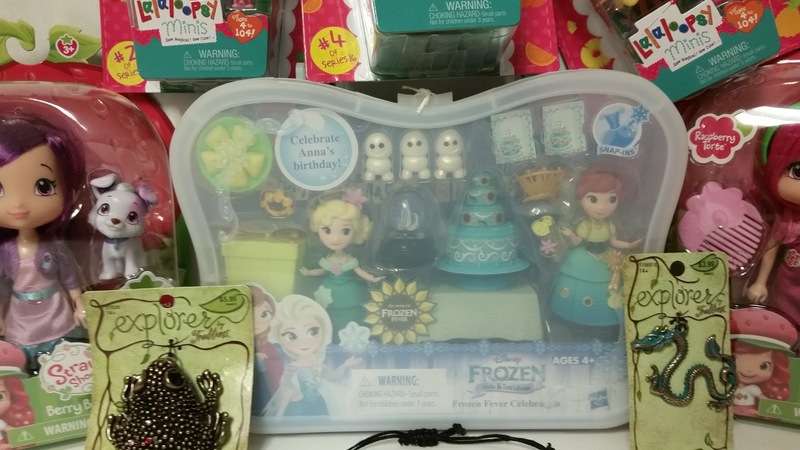 And I did also cave and buy the Frozen Little Kingdom Frozen Fever set. ...and here it is with the package opened. I love the reusable cases, but I almost wish they weren't frosted plastic. It's amazing how much duller the vibrant colors look behind the opaque cover. 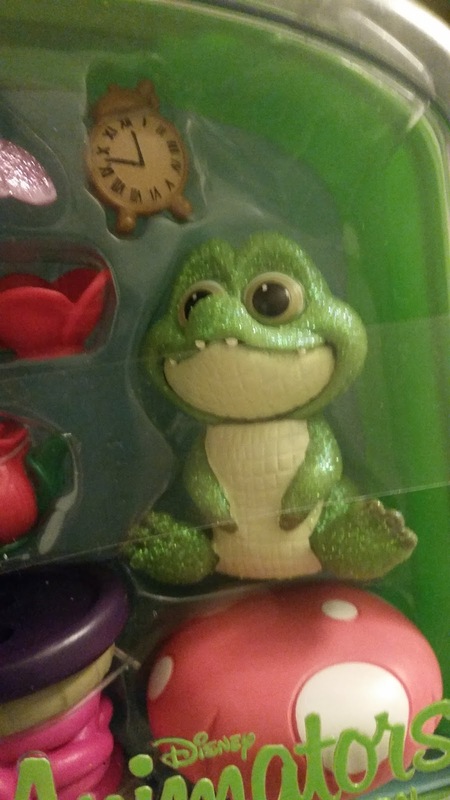 It makes the option of keeping them mint in package not as likely...at least for me. 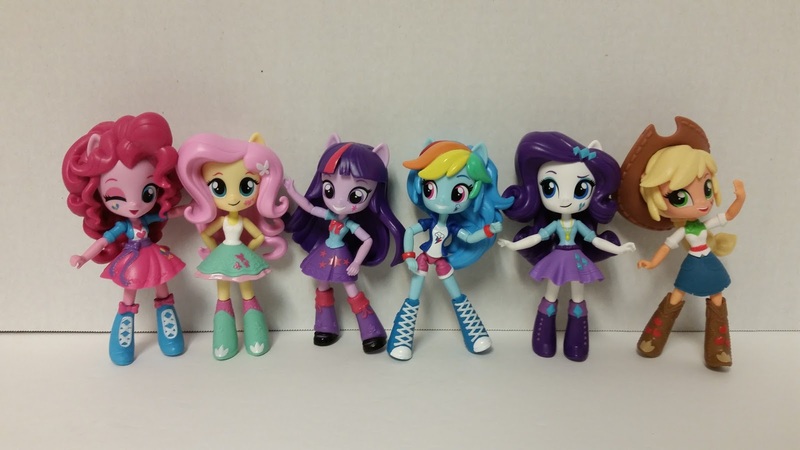 So now I have all of the mane six. It's so fun having all six of them now. I don't know that I'll get many of the other versions of these characters, as my space is running out, but I'm glad I at least got these gals. 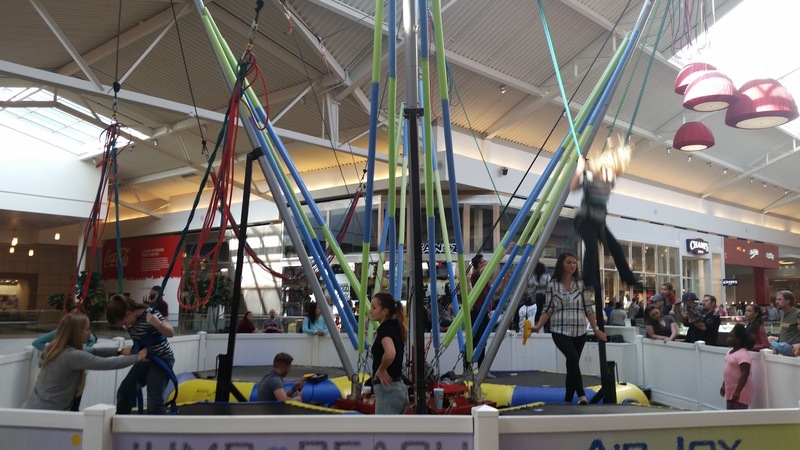 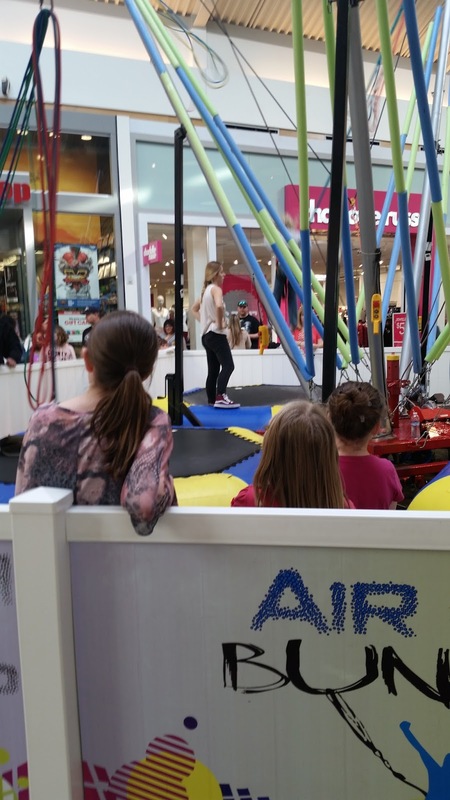 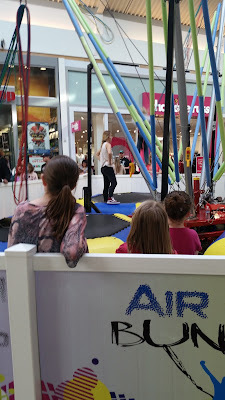 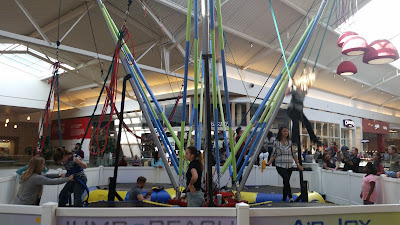 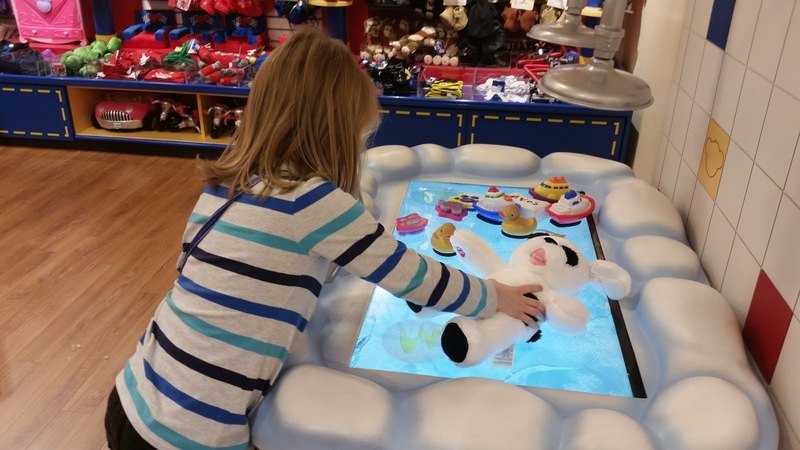 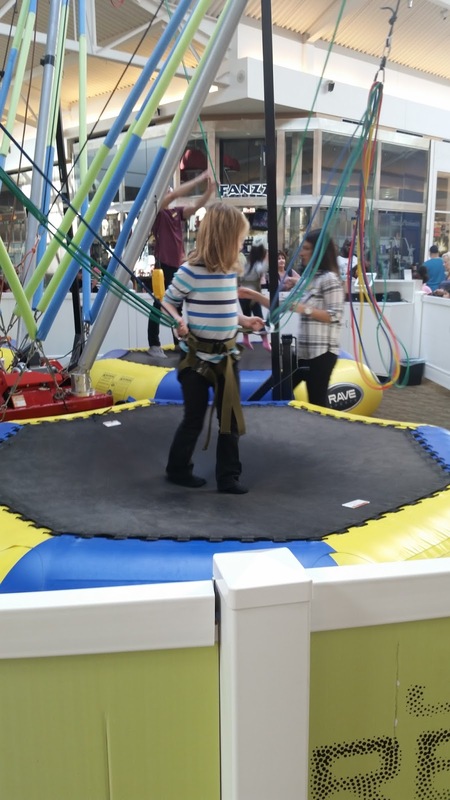 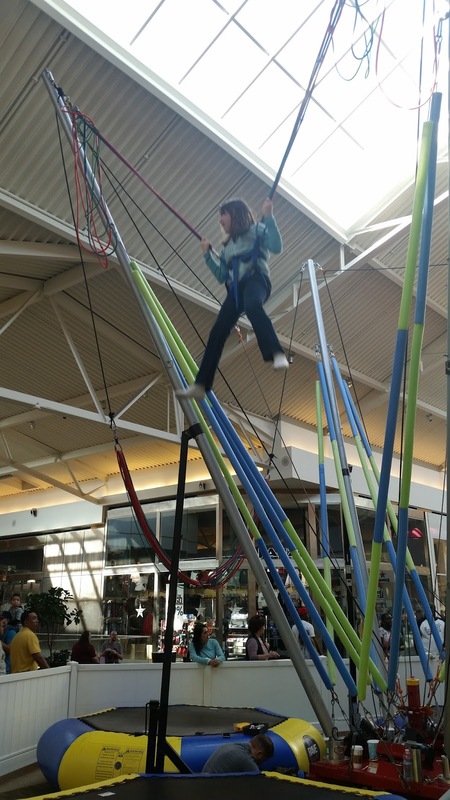 I was thinking it would be fun to get the girls' take on some of the toys they purchased. 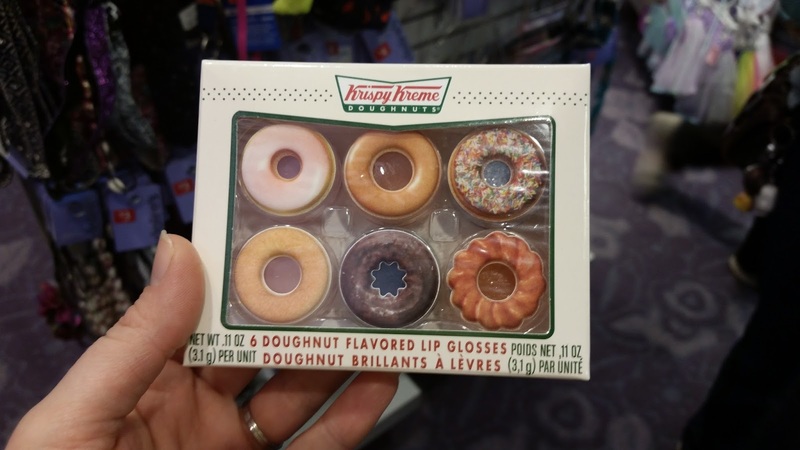 We'd probably do mini reviews to keep things simple. 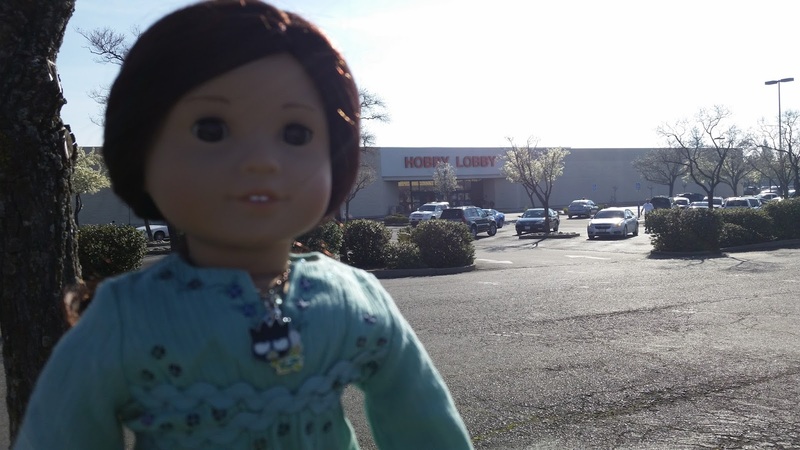 But if there are any of the things they bought that you'd especially like to see in better detail, let me know and we'll put those at the top of the review list.